If you've been searching for the perfect executive desk toy, then you've come to the right place. 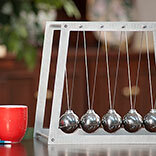 Our Giant Newton's Cradle will be the centerpiece of your desk and your office. Not only will it impress everyone who comes through your doors, but it will also serve to be your source of daily inspiration. The concept behind the executive sphere clicker certainly isn't a new one. However, over the years this has typically meant small, cheap and overall shoddily constructed products. That's not the case with the Giant and Giant Junior Newton's Cradle. Executive desk toys should mean high quality items that someone can display proudly and our Newton’s Cradles exceed the highest expectations of quality and design. Our patented design is based on durability, utility and beauty. It's hand assembled and crafted with laser precision, with components such as nickel plated chrome steel spheres, galvanized aircraft cable, and an aircraft aluminum frame. We make two different Newton’s Cradles either of which is the perfect executive desk toy. The Giant Junior size is 12 inches by 7.75 inches, and stands 11 inches tall, with five 1.5 inch balls and a total weight of nearly 5 pounds. The Giant Newton’s Cradle is 17 inches by 10 inches, and is 1 foot 2 inches tall. With a total weight of nearly 11 pounds, and five 2.5 inch nickel plated chrome steel spheres, the design is an awe inspiring piece of art that anyone would be proud to display on a desk or anywhere else. 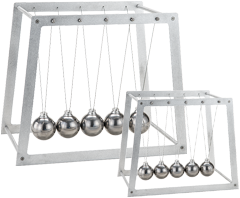 Whether you're buying the Newton's Cradle for yourself, as a gift to a family member or friend, or for your own boss, it's sure to be a smashing success. 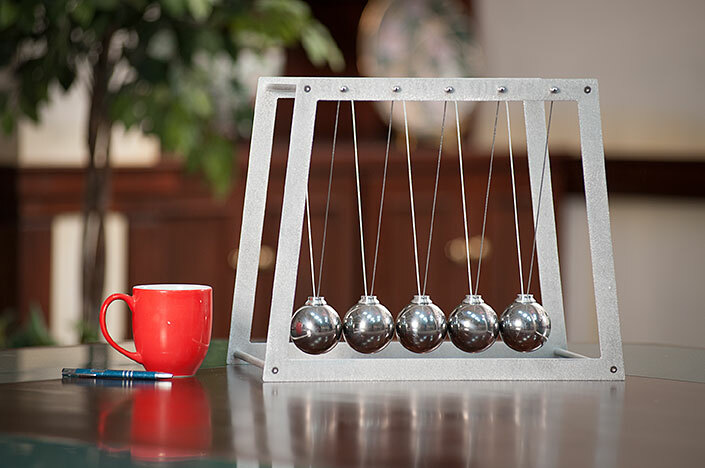 Don't settle for a regular old executive sphere clicker or desk toy when you can show off the patented beauty and precision of the Giant Newton's Cradle. These Newton's Cradles are great for demonstration purposes. Our Giant Newton's Cradles are works of art that combine physics and industrial design to make beautiful table top and display pieces. These Newton's Cradles impress everyone who sees them. They're the perfect executive desktop piece and make great gifts.